Model, map, and access data effectively with Entity Framework Core 2, the latest evolution of Microsoft’s object-relational mapping framework. You will access data utilizing .NET objects via the most common data access layer used in ASP.NET Core MVC 2 projects. 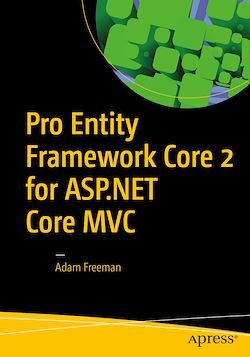 Best-selling author Adam Freeman explains how to get the most from Entity Framework Core 2 in MVC projects. He begins by describing the different ways that Entity Framework Core 2 can model data and the different types of databases that can be used. He then shows you how to use Entity Framework Core 2 in your own MVC projects, starting from the nuts and bolts and building up to the most advanced and sophisticated features, going in-depth to give you the knowledge you need. Chapters include common problems and how to avoid them.